Indeed. This is so true. 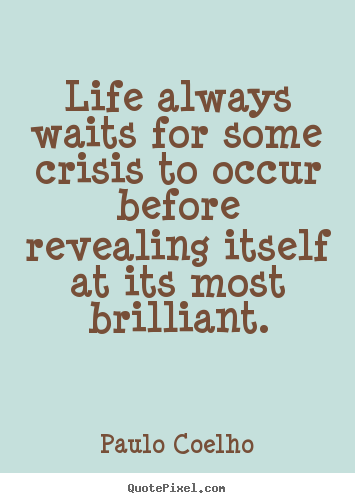 Most often when we go through a crisis in Life, we think it’s all over. And we can’t be blamed. Because the human mind thinks only logically. So, when you cannot see the light at the end of a dark tunnel, you have to rely on your mind’s assessment and conclusion that an endless dark tunnels goes nowhere. This is how fear and insecurity, which are manifestations of the mind, control and consume us. But what seemed like romantic philosophy from Nietzsche has found some scientific backing in recent times. In a 2011 report on the correlation between adversity and resilience, researcher Mark Seery, a psychologist at the University of Buffalo, in the US, says that although traumatic experiences such as losing a loved one can be psychologically damaging, small amounts of trauma can make us more resilient. I have a more experiential take on this. If you look back at your own Life and make a list of your own “no-way-ahead” moments, you will realize that while those times were really dark, often scary, they were important for your personal evolution. When you reflect on them now, you find yourself both grateful for the experience__because it has made you tougher__and feel that the challenge, the crisis, gave your Life a new perspective. · What is this situation trying to tell me? · What is the best decision/action I can take? · What collaborations/outside help must I seek? · What can I learn from it? This approach has helped me immensely. It may not often solve the crisis for me immediately but gives me the courage and equanimity to face it and deal with it effectively. I have realized that every crisis has a teachable point of view. When you learn the lesson, a similar crisis may just arrive in some time – not to torment you, but it’s Life’s way of testing if you have indeed learned the lesson. And newer crises often arrive too, with levels of difficulty that are always higher, and far more complex, than the previous ones. So, in a way, Life’s like many of those computer games that people play. You get better with each game, with each play. Only to ascend in levels of challenge and learn to play the game better. Which is why, it makes imminent sense to remember what Nietzsche said and Clarkson sang!